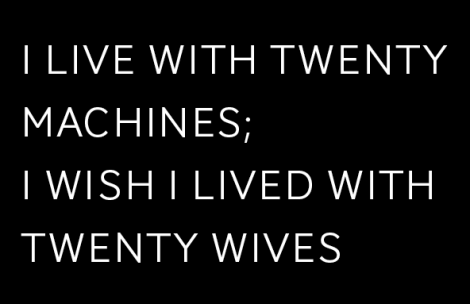 221A Artist Run Centre is pleased to present I live with twenty machines; I wish I lived with twenty wives. Drawing its title from a lyric in a generic mid-90ʼs indie-rock song, the exhibition brings together Vancouver based artists Scott Billings, Josh Hite and Jay Pozo whose work explores technology both as medium and as subject matter, highlighting the cultural transformations that have taken place over the last decade as mobile technologies, cameras, and social media (YouTube, Facebook, Flickr, etc.) have allowed every aspect of our lives to be recorded, represented and re-lived online. It should come as no surprise that technologies that promise to bring us together also serve to compartmentalize our experience of the world. Much of our daily experience consists of situations in which we attempt to abstract ourselves from our physicality – we seal out external sights and sounds and replace them with recorded / generated ones. We watch television and movies, and immerse ourselves in on-line games and virtual worlds whose explicit aim is the denial and substitution of the body and of physical experience. Even the act of watching has become more private – from the movie theatre (a large group experience), to the television (viewable alone or in a small group), down to the screen of a laptop or an iPhone (a decidedly solitary experience). At the same time, we record and make documents of our lives like never before. Cameras and video recorders have shrunk down to a fraction of their original size, and are with us always (as part of our phones). Social Media sites like YouTube and Facebook host this content we record and make it available to anyone. The immense amount of documentation that we create, (and the monumentalization that is an implicit part of the act of recording), would seem to imply that we live unprecedentedly interesting lives, although that is almost surely not the case. At the logical extremes, it would seem that we are spending our days watching the lives of others online, and then making and posting documents of ourselves engaged in the act of watching.